Objective and Background: Inhibition of acetylcholinesterase (AChE) has gained much importance since the discovery of the involvement of peripheral anionic site as an allosteric regulator of AChE. Characterized by the formation of β-amyloid plaques, Alzheimer's disease (AD) is currently one of the leading causes of death across the world. Progression in this neurodegenerative disorder causes deficit in the cholinergic activity that leads towards cognitive decline. Therapeutic interventions in AD are largely focused upon AChE inhibitors designed essentially to prevent the loss of cholinergic function. The multifactorial AD pathology calls for Multitarget-directed ligands (MTDLs) to follow up on various components of the disease. Considering this approach, other related AD targets were also selected. 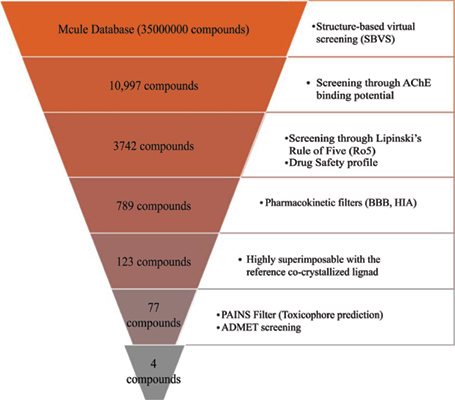 Structure-based virtual screening was relied upon for the identification of lead compounds with anti-AD effect. Method: Several chemoinformatics approaches were used in this study, reporting four multi-target inhibitors: MCULE-7149246649-0-1, MCULE-6730554226-0-4, MCULE-1176268617-0-6 and MCULE-8592892575-0-1 with high binding energies that indicate better AChE inhibitory activity. Additional in-silico analysis hypothesized the abundant presence of aromatic interactions to be pivotal for interaction of selected compounds to the acetyl-cholinesterase. Additionally, we presented an alternative approach to determine protein-ligand stability by calculating the Gibbs-free energy change over time. Furthermore, this allows to rank potential hits for further in-vitro testing. Results and Conclusion: With no predicted indication of adverse effects on humans, this study unravels four active multi-target inhibitors against AChE with promising affinities and good ADMET profile for the potential use in AD treatment. AChE, ADMET, Alzheimer's disease (AD), Molecular docking, Pharmacoinformtics, Virtual screening.